This tourney is more practice for nationals. We want more Texas area players ready to go and to do well. Therefore, I will try to replicate the rules for nationals as much as possible. I hope the many V3 issues will be solved before our event, but if not, I will do my best to guess. Right now, I predict the new Tank Destroyer rules will be in effect, and the KYE changes will also be in effect for Mid War. So, the rule book will override the arsenal. This means medium mortars, breakthrough guns, bunker busters, and motorcycle recon will be applied to mid war at the present points. Lists	checked by the judge that are later found to be in error will be	fixed at the time the error is detected in the least obtrusive way	that is fair to both players. Scores from previous games will stand. 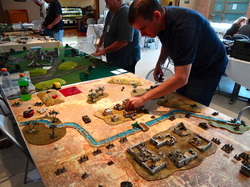 Lists	not sent in to the judge by the deadline, or errors in deployment	(wrong type or number of figs) may be penalized by loss of offending	platoons, score penalties, and/or disqualification. I recommend you get your list checked, but it's up to you. I hear the judge can be tough. Painting standard is being applied. All figures must be appropriately base coated and the following parts painted appropriately: Flesh, headgear, tires, treads, mud (mud, snow, grass, sand, etc. are all appropriate). If you are willing to bring terrain, please contact me by email or on the forum. Walk-ups are welcome, but pre-registered folks are gauranteed a spot. Changes and updates will appear on the forum, and while we will attempt to update this page, the forum is the best place for the latest news.